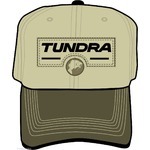 Toyota TUNDRA on a new tan and green ball cap. It has adjustable strap with buckle in the rear. One of a kind with just 3 left.